It’s official: the sequel to id Software’s 2011 post-apocalyptic shooter – and last game under the supervision of founder John Carmack – is real, and we’re itching to get back into the wasteland now that we know a more detailed Rage 2 release date than 2019. Not that many people were asking for it: Rage was divisive when it originally came out, due to a cliched story and awkward open world. Then again, never had the end of the world looked so good, thanks to the id Tech 5 engine and its bonkers megatextures. 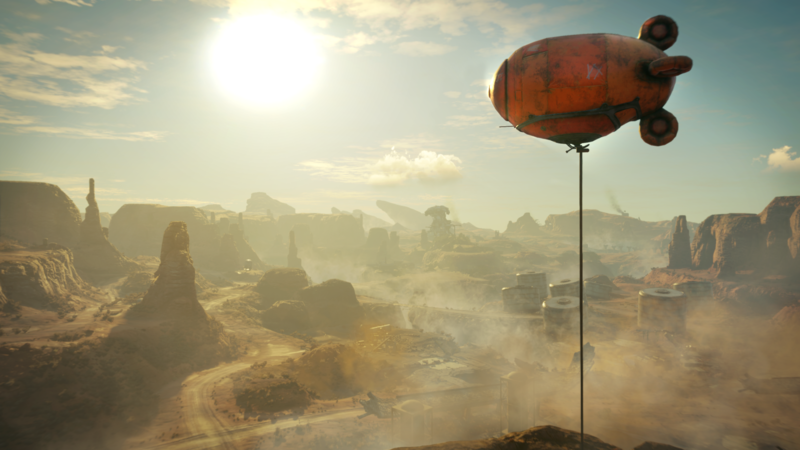 Now, with Rage 2, we are hoping to see a refined, more complete version of id’s ambitious vision. This time Rage will be developed by id and Avalanche Studios, the folks behind Just Cause 3 and, fittingly, Mad Max. As we have seen more of the game at E3 2018, details on Rage 2’s release date, gameplay, and, story are starting to emerge. 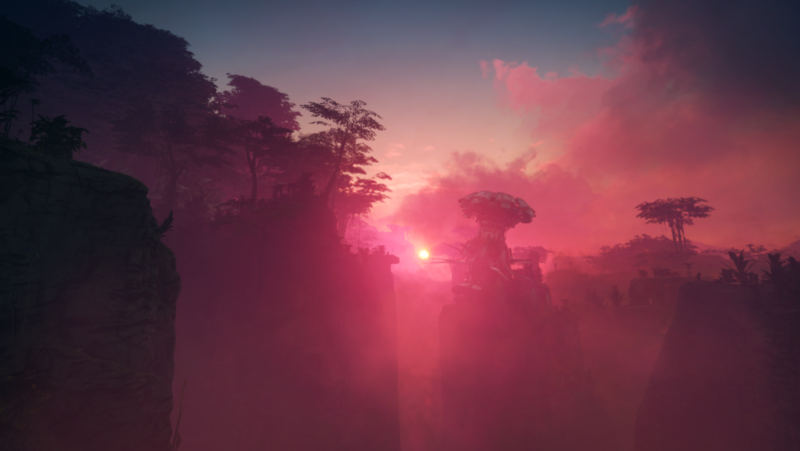 Rage 2’s gameplay in particular is set to blow the original away in a cloud of bright pink smoke. Below you’ll find everything we know about Rage 2. The Rage 2 release date is 14 May 2019, according to the Steam store page. So not long to wait until we’ll be able to wreak post-apocalyptic havoc. 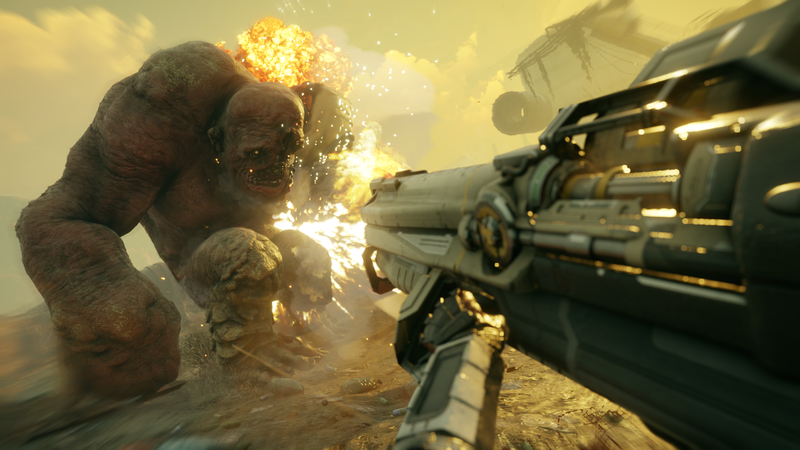 Above you can see the Eden Assault gameplay trailer from Quakecon 2018, showing off a variety of Rage 2’s features, from gunplay to convoy takedowns. 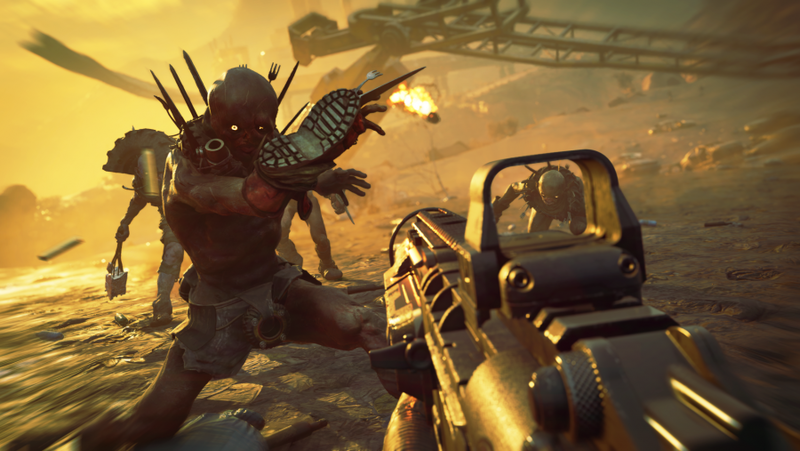 After a series of Bethesda teases on Twitter – and a Walmart Canada leak – the live action Rage 2 trailer above is the publisher’s first official confirmation of the game’s existence. Besides the darkly comic tone, the trailer doesn’t give much away – apart from aggressive and insistent warning that we should ‘get ready to die!’. Charming. The dark humour shows no sign of abating in this Rage 2 gameplay trailer. Looking an awful lot like a mix of Borderlands and Fallout 4, we see bandits, massive mutants, and lots of vehicular pedal-to-the-metal action. In the Rage 2 E3 trailer we hear from our new protagonist, Walker, and his origin story. He is clearly a man filled with the eponymous anger he needs to turn bandits, mutants, and the evil Authority into garish pink mush. 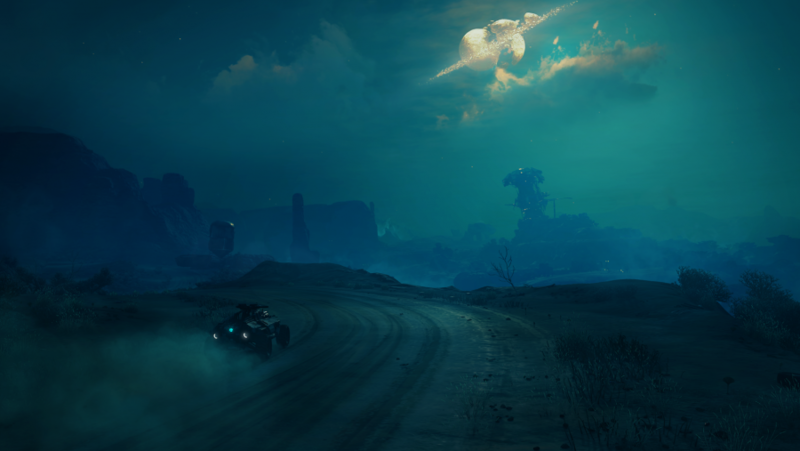 The new vehicular gameplay is shown off as Ranger make his way to an enemy outpost to pilfer a rare artefact. We also see an ecopod fall from the sky and one of Walker’s unlockable special attacks. Shatter is an emphatic push move that sends enemies flying. Tipped to be a ‘shooterverse’, Rage 2’s gameplay promises to be more than a shooter and an open-world game. 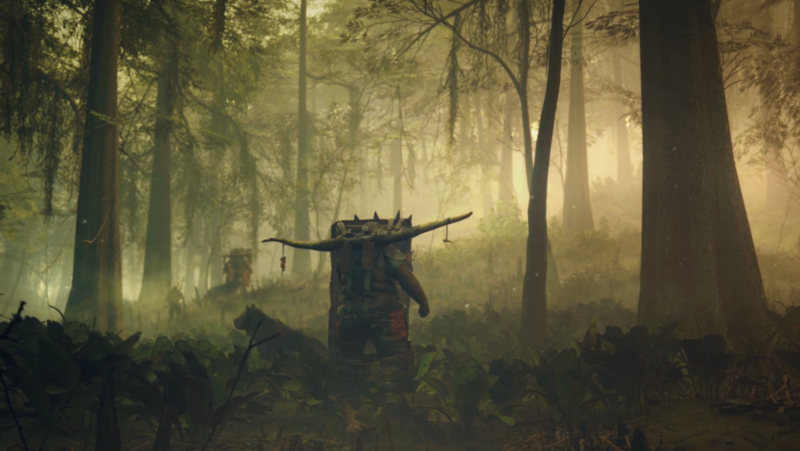 The original wasn’t quite an open world – instead you had a series of connected open areas and hubs – and a Mad-Max-style world through which to freely adventure seems a great fit for the series. Vehicles will also be making a return and they look more rugged and fun than ever. 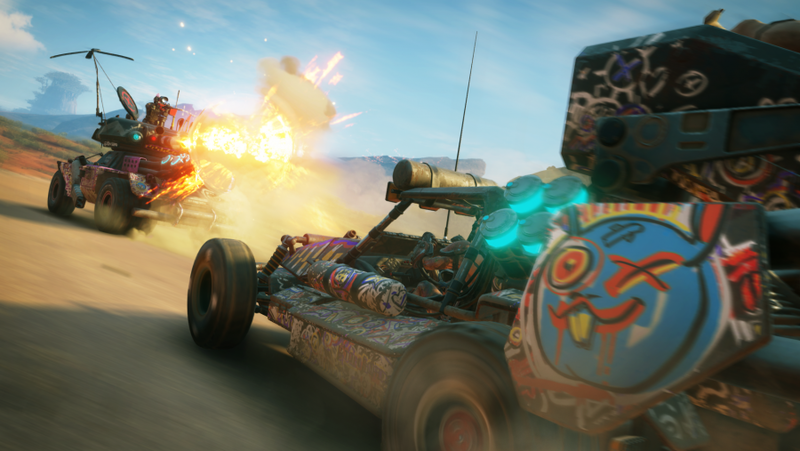 There were five vehicle types in the first Rage, and we know we will get even more sets of wheels with which to drive at silly speeds in Rage 2. That includes, as we saw in the Rage 2 QuakeCon 2018 trailer the chance to bring the pain to enemy convoys. Hopefully, we can customise them too, with the freedom to hold off on the neon pink. Rage’s gameplay was one of its strongest elements, but your Rage 2 weapons have been ramped up even more. The sharp-edged boomerang that is the Wingstick will be coming back, complete with a variety of new tricks such as targeting enemies around corners. Then there’s the ability to Overdrive your tools of destruction to push them beyond their normal limits and unlocking advanced abilities for your weapons. You can buff and create new weaponry with the returning crafting system. Your hero in Rage could use nanotrites to resurrect himself. Now, in Rage 2, the fiction around this technology allows you more abilities that all come with unlockable upgrades. Among those is a slam attack that causes radius effect damage, a shatter move to push enemies away, a double jump, and a dash that lets you sidestep opponents. To turn the tide against the Authority, you’ll need to take the fight to the numerous factions and monsters that are vying for control of the wasteland. Unlike Fallout: New Vegas, for instance, Rage 2 factions aren’t there to add another layer of roleplaying. but merely exist to “provide you with background for the world” according to Magnus Nedfors, creative director at Avalanche Studios. “There are enemy groups and you fight them in different ways,” Nedfors says . These groups include the hyper-violent punk Goon Squad; the River Hogs; and the Immortal Shrouded, a team of elite bandits equipped with advanced tech such as cloaking. However, it has been confirmed to us that there will be no Rage 2 multiplayer. According to Tim Willets, studio director at id Software, decimating this destroyed world with a friend would be impossible since “the game is so damn big.” Nedfors says that he and the team at Avalanche are just “focusing on making the best single-player story we can.” Hopefully that in itself will make you play longer but, there is also other “fun stuff” in the game to keep you playing, but that stuff won’t be Rage 2 loot boxes. Thanks to the id Tech 5 engine, Rage stunned players with its visuals, so we’re hopeful that the Rage 2 graphics are just as impressive. From what we have seen so far that hope isn’t misplaced. 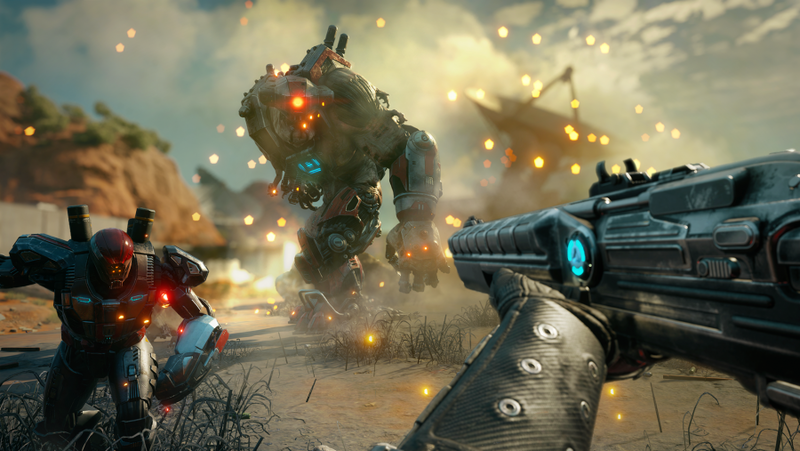 Rage 2 will be powered by the Apex engine, which allows Avalanche to do more than the studio have ever been able to in their titles, and all without any pesky loading screens when roaming from area to area. Moreover, the mysterious space technology that came down from the sky allows vegetation to grow and new biomes to be created to diversify from the arid browns of the original Rage. The narrative of the original Rage was a weak link next to its great graphics and brutal combat. Its twists were predictable and the lore contextualising the world felt derivative. This time we are hoping for a stronger story with original and engrossing moments, and it certainly looks like we have that. 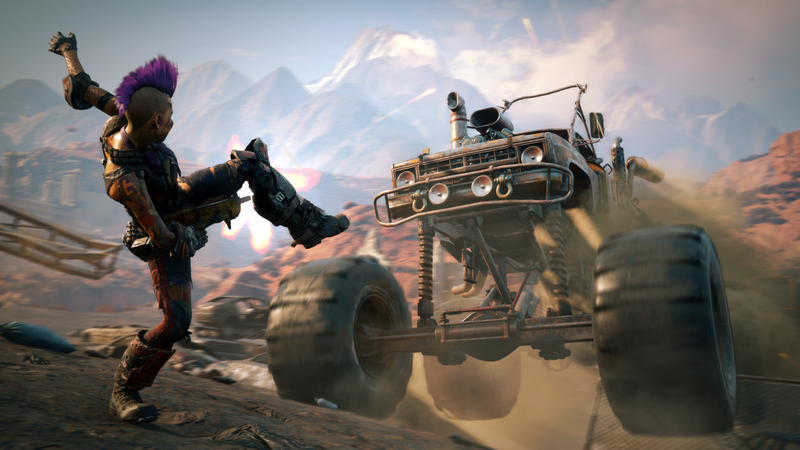 In Rage 2, 80% of Earth’s population has been decimated by an asteroid and, needless to say, things aren’t looking rosy as vicious gangs stalk the open road and the mysterious Authority looks to stake its claim to power amid the chaos. That said, this world is in better shape this time now that the ecopods have rained down from space, drilling into the ground and purifying the water. This allows greenery to grow and explains the richer colour palette Rage 2 showcases. In this annihilated hellscape you are Walker – a Ranger that poses a threat to the tyrannical regime. Naturally, as you are attacked, robbed, and left for dead, you will take your revenge on the new evils that rampage across Earth with a brutal bevy of weapons.